Everyone knows that this is a tough housing market, and sellers are getting creative as they attempt to lure picky buyers. Some sellers are hiring home stagers, professionals who come into your home and tell you how to make it more attractive to buyers, so that you can get top dollar, even in this down market. Professional home stagers are especially popular among people selling high-end homes, where increasing the price by a percentage point or two can more than pay for the stager’s fee. But even if you can’t afford a professional stager, you can benefit from a few of their tips. According to The Home Buying Institute, one of the most important things you can do to stage your own home is to get rid of your clutter. You want buyers to be able to see your home as theirs. Plus, buyers don’t want to look at piles of your personal things. It makes them vaguely uncomfortable, and it also makes your house look smaller and shabbier. Also, clean your house until it shines. That means vacuuming the cobwebs and washing the windows. You might have to clean every day while your house is on the market, but it is critical to getting a good price for your home. You want potential buyers to think of your home as cleaner, brighter and more pleasant than theirs. First, make sure your paint is fresh and clean; touch up any areas that need it. Repair any cracks in your stairs, and stain or seal your deck. Keep your yard neatly mowed and edged. If your grass is in very bad shape, consider replacing it with sod; give the sod a chance to take root and look healthy before you put your house on the market. In the spring or summer, plant flowers and put pots of flowers on porches and decks. And use mulch liberally in flower beds and landscaping. Keep the outside of your home neat. Think about what potential buyers see when they pull up to the house. Rake the leaves, weed the flower beds, mow the lawn or shovel the walk. The kitchen is the heart of a home, and it is one of the most important rooms to most buyers. Start by cleaning your kitchen, then clean it again, the experts say. You want your windows, your floor, your counters and your appliances to sparkle; then open curtains and turn on lights to show off your cheery, airy kitchen. Clean out your cabinets and clear off your counters, to make your kitchen look like it has more work and storage space. If you have a table in your kitchen, set it with nice china and glassware, and add a vase of flowers. Paint the walls in a neutral color, if necessary, especially in areas that are prone to grease. Scrub your cabinet fronts, and consider updating cabinets, counters or appliances, if you can afford it. Like your kitchen, you want your bathrooms to sparkle. Scrub everything. Replace the old shower curtain, and hang new, plush towels. Consider replacing your faucets, if they are outdated. Put out your best soaps, and consider adding some flowers to make your bathroom look—and smell--better. Remove your personal pictures and memorabilia. You want to make it easy for potential buyers to imagine themselves living in the house. Consider freshening the paint in a neutral color, then add splashes of color with coordinating pillows and rugs. Get rid of shabby furniture, even if you have to rent or borrow some nicer pieces. 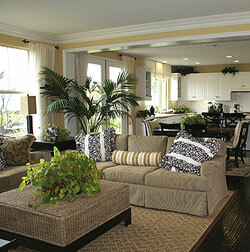 Arrange the furniture into conversation areas, to make the room look inviting. If you have a fireplace, make it the focal point of the room. Minimize the knick-knacks on tables and on your fireplace mantel. Instead, use flowers to create color and a lovely scent. You want the bedrooms to look clean and comfortable. Use neutral colors, with brighter accents like pillows. Don’t put a lot of furniture in your bedroom, because that makes it look more cramped. Consider buying some new, luxurious bedding, to make your bed look extra comfortable. And again, put away your clutter and personal items, so that potential buyers can imagine the room as theirs.